We design dynamic and entertaining events with a computer. 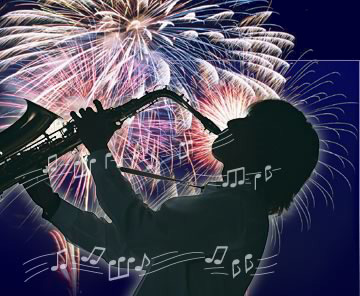 Using our advanced computerized firing system controlling the split second timing of shooting, we can create the fantastic pyromusical shows. While many Japanese like the traditional fireworks, a series of a huge single shell shooting at a time, several ten seconds apart, it is more popular to see the fireworks event as a musical show in other countries. 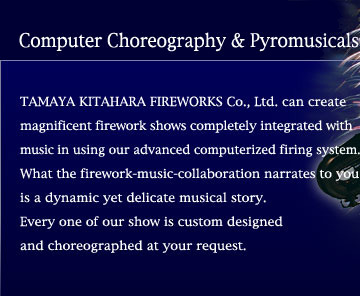 We can promise your satisfaction with our Computer Choreography & Pyromusicals technique learned from numerous experiences of joining oversea competitions. 5 -20 minutes shows with a speedy development are very common.